What is meant by the term “Investment”? What do economists mean by investment, or investment expenditure? In calculating GDP, investment does not refer to the purchase of stocks and bonds or the trading of financial assets. It refers to the purchase of new capital goods, that is, business equipment, new commercial real estate (such as buildings, factories, and stores), residential housing construction, and inventories. Inventories that are produced this year are included in this year’s GDP—even if they have not yet sold. From the accountant’s perspective, it is as if the firm invested in its own inventories. Business investment in 2012 was over $2 trillion, according to the U.S. Bureau of Economic Analysis. Table 1 shows how these four components of demand added up to the GDP in 2016. Figure 1 provides a visual representation of the five categories used to measure GDP by the components of demand. Figure 1. Components of U.S. GDP. Consumption accounted for 68.7% of total GDP, investment expenditure for 16.3%, government spending for 17.6%, while net exports (exports minus imports) actually subtracted 2.7% from total GDP. 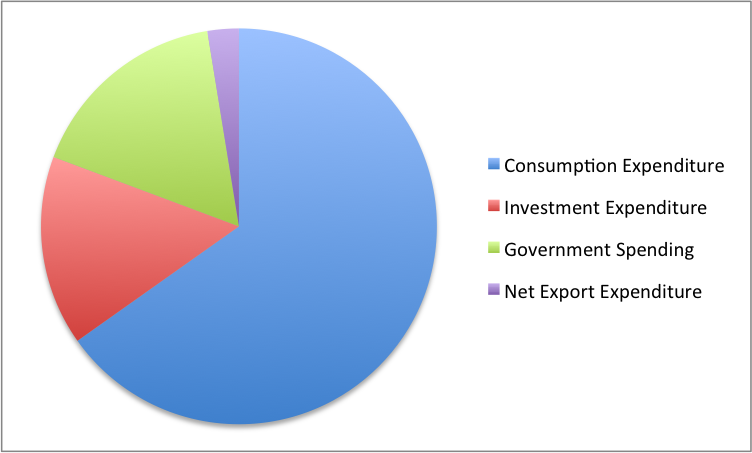 The pie chart gives a nice visual of the components of GDP, but keep in mind that since the net export expenditure share is negative, the size of the pie is only approximately correct. Figure 2(a) shows the levels of consumption, investment, and government purchases over time, expressed as a percentage of GDP. Consumption expenditure, that is, spending by households and individuals, is about two-thirds of GDP, but it moves relatively little over time. Investment expenditure and government spending on goods and services are each about the same order of magnitude, 15-20% of GDP. Investment is the most variable category of expenditure, increasing and decreasing more than the other categories. Figure 2(b) shows the levels of exports and imports as a percentage of GDP over time. Exports are added to total demand for goods and services, while imports are subtracted from total demand. If exports exceed imports, as in most of the 1960s and 1970s in the U.S. economy, a trade surplus exists. If imports exceed exports, as in recent years, then a trade deficit exists. Figure 2. Components of GDP. (Source: http://bea.gov/iTable/iTable.cfm?ReqID=9&step=1). Consumption expenditure by households is the largest component of GDP, accounting for more than two-thirds of the GDP in any year. This tells us that consumers’ spending decisions are a major driver of the economy. However, consumer spending is a gentle elephant: when viewed over time, it does not jump around too much (as shown in Figure 2). In recent years, consumption has been creeping up towards 70%. Investment includes any addition to business inventories. If you noticed any of the infrastructure projects (new bridges, highways, airports) launched during the recession of 2009, you saw how important government spending can be for the economy. Government expenditure in the United States is about 20% of GDP, and includes spending by all three levels of government: federal, state, and local. The only part of government spending counted in GDP is government purchases of goods or services produced in the economy. Examples include the government buying a new fighter jet for the Air Force (federal government spending), building a new highway (state government spending), or a new school (local government spending). A significant portion of government budgets are transfer payments, like unemployment benefits, veteran’s benefits, and Social Security payments to retirees. These payments are excluded from GDP because the government does not receive a new good or service in return or exchange. Instead they are transfers of income from taxpayers to others. What taxpayers spend the income on is captured in consumer expenditure. When thinking about the demand for domestically produced goods in a global economy, it is important to count spending on exports—domestically produced goods that are purchased by foreigners. By the same token, we must also subtract spending on imports—goods produced in other countries that are purchased by residents of this country. The net export component of GDP is equal to the value of exports (X) minus the value of imports (M), (X – M). The gap between exports and imports is also called the trade balance. If a country’s exports are larger than its imports, then a country is said to have a trade surplus. In the United States, exports typically exceeded imports in the 1960s and 1970s, as shown in Figure 2(b). Since the early 1980s, imports have typically exceeded exports, and so the United States has experienced a trade deficit in most years. Despite growth in the trade deficit in the late 1990s and in the mid-2000s, the deficit typical remains less than 5% of GDP. Figure 2(b) also shows that imports and exports have both risen substantially in recent decades, even after the declines during the Great Recession between 2008 and 2009. As noted before, if exports and imports are equal, foreign trade has no effect on total GDP. However, even if exports and imports are balanced overall, foreign trade might still have powerful effects on particular industries and workers by causing nations to shift workers and physical capital investment toward one industry rather than another. Government economists at the Bureau of Economic Analysis (BEA), within the U.S. Department of Commerce, construct estimates of GDP from a variety of sources. Consumption. Once every five years, in the second and seventh year of each decade, the U.S. Census Bureau carries out a detailed census of businesses throughout the United States. In between, it carries out a monthly survey of retail sales. These figures are adjusted with foreign trade data to account for exports that are produced in the United States and sold abroad and for imports that are produced abroad and sold here. Once every ten years, the Census Bureau also conducts a comprehensive survey of housing and residential finance. Together, these sources provide the main basis for figuring out what is produced for consumers. Investment. For investment, the Census Bureau carries out a monthly survey of construction and an annual survey of expenditures on physical capital equipment. Government Spending. For what is purchased by the federal government, the statisticians rely on the U.S. Department of the Treasury. An annual Census of Governments gathers information on state and local governments. Because a lot of government spending at all levels involves hiring people to provide services, a large portion of government spending is also tracked through payroll records collected by state governments and by the Social Security Administration. Net Exports: With regard to foreign trade, the Census Bureau compiles a monthly record of all import and export documents. Additional surveys cover transportation and travel, and adjustment is made for financial services that are produced in the United States for foreign customers. Many other sources contribute to the estimates of GDP. Information on energy comes from the U.S. Department of Transportation and Department of Energy. Information on healthcare is collected by the Agency for Health Care Research and Quality. Surveys of landlords provide information about rental income. The Department of Agriculture collects statistics on farming. All of these bits and pieces of information arrive in different forms, at different time intervals. The BEA melds them together to produce estimates of GDP on a quarterly basis (every three months). These numbers are then “annualized” by multiplying by four. That is, quarterly GDP estimates what annual GDP would be if the trend over the three months continued for twelve months. As more information comes in, these estimates are updated and revised. The “advance” estimate of GDP for a certain quarter is released one month after a quarter. The “preliminary” estimate comes out one month after that. The “final” estimate is published one month later, but it is not actually final. In July, roughly updated estimates for the previous calendar year are released. Then, once every five years, after the results of the latest detailed five-year business census have been processed, the BEA revises all of the past estimates of GDP according to the newest methods and data, going all the way back to 1929. Visit this website to read FAQs on the BEA site. You can even email your own questions! The Expenditure Approach divides GDP based on who is doing the spending: Consumption (households), Investment (businesses and households), Government Spending (governments) and Net Exports (the rest of the world). GDP can also be measured by examining what is produced, instead of what is demanded. Everything that is purchased must be produced first. Table 2 breaks down GDP a different way, based on the type of output produced: durable goods, nondurable goods, services, structures, and the change in inventories. Consumer Expenditure (from the expenditure approach you read about above) consists of spending on durable goods, nondurable goods, and services. The same thing is true of Government and Net Export Expenditures. 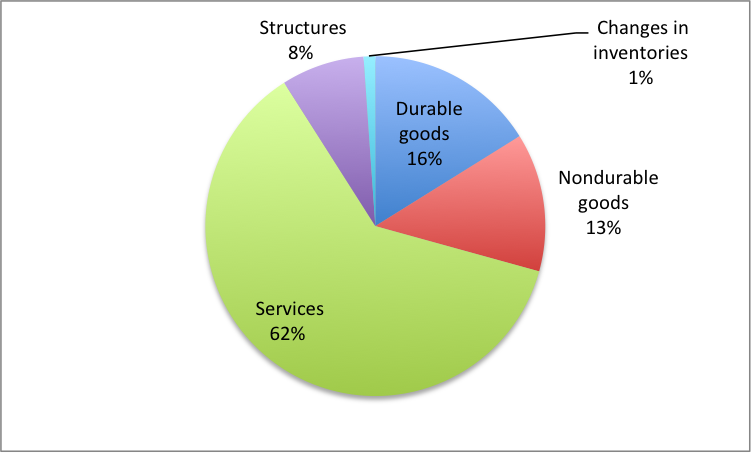 Investment Expenditures is a combination of durable goods (like business equipment) and structures e.g. factories, office buildings, retail stores and residential construction). Figure 3 provides a visual representation of the five categories used to measure GDP by type of product. Figure 3. GDP by type of product, 2016. Note that whether you decompose GDP into expenditure components or by type of product the total is exactly the same. Figure 4 shows the components of GDP by Type of Product, expressed as a percentage of GDP, since 1960. 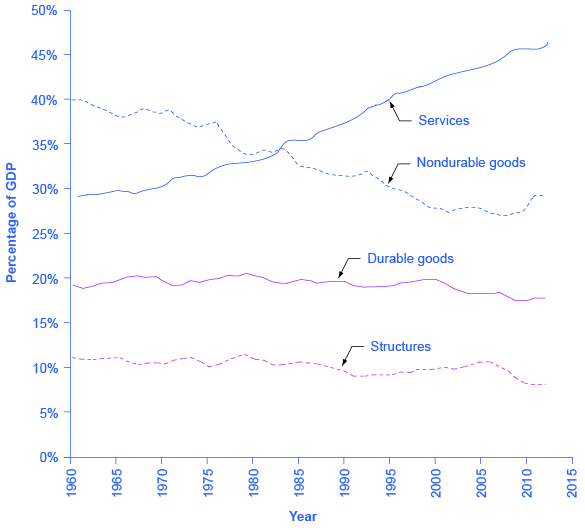 Services are the largest single component of GDP, representing over half. Nondurable goods used to be larger than durable goods, but in recent years, nondurable goods have been dropping closer to durable goods, which is about 15% of GDP. Structures hover around 10% of GDP, though they’ve been declining in recent years. The change in inventories, the final component of aggregate supply, is not shown here; it is typically less than 1% of GDP. Figure 4. Types of Product. In thinking about what is produced in the economy, many non-economists immediately focus on solid, long-lasting goods, like cars and computers. Goods that last three or more years are called durable goods. Goods that last less than three years are called nondurable goods. By far the largest part of GDP, however, is services. Moreover, services have been a growing share of GDP over time. A detailed breakdown of the leading service industries would include healthcare, education, and legal and financial services. It has been decades since most of the U.S. economy involved making solid objects. Instead, the most common jobs in a modern economy involve a worker looking at pieces of paper or a computer screen; meeting with co-workers, customers, or suppliers; or making phone calls. Even within the overall category of goods, Table 2 shows that long-lasting durable goods like cars and refrigerators are about the same share of the economy as short-lived nondurable goods like food and clothing. The category of structures includes everything from homes, to office buildings, shopping malls, and factories. The new structures that were built, or produced, during a time period are counted in this measure of GDP, which is another way of looking at investment, as it was discussed above in focusing on demand to measure GDP. Inventories is a small category that refers to the goods that have been produced by one business but have not yet been sold to consumers, and are still sitting in warehouses and on shelves. The amount of inventories sitting on shelves tends to decline if business is better than expected, or to rise if business is worse than expected. When a business produces output but fails to sell it, the increase in inventory is treated as an investment expenditure. GDP is a measure of what is produced in a nation. The primary way GDP is estimated is with the Expenditure Approach we discussed above, but there is another way. Everything a firm produces, when sold, becomes revenues to the firm. Businesses use revenues to pay their bills: Wages and salaries for labor, interest and dividends for capital, rent for land, profit to the entrepreneur, etc. So adding up all the income produced in a year provides a second way of measuring GDP. This is why the terms GDP and national income are sometimes used interchangeably. The total value of a nation’s output is equal to the total value of a nation’s income.